Master Jung is currently an 8th Dan Black Belt and president of the World Hapkido Association. His role as president continues a lifelong committment to teach and promote the martial arts. As a young boy, Tae Jung started martial arts training to overcome his weakness of body and mind. He was fortunate to have received the finest training under great masters in Seoul, South Korea, where he was born. Among them was Grand Master Inshik Hwang, who is a 2nd generation master taught by the founder of Hapkido, Yong-Sool Choi, and who directed and choreographed the fight scenes in Jackie Chan's earlier Hong Kong films. Master Jung also mastered the art of Guhm-Do (swordsmanship) through the guidance of legendary swordsman Grand Master Kim Sohk-Soon. After years of hard training, the Korea Hapkido Association honored Master Jung with an Instructor's certificate in 1975. He started his career as a martial arts instructior at the United States 8th Army Headquarters in Young-San, Korea where thousands of U.S. soldiers occupied ranks. These soldiers trained with Master Jung in the Trent Gym until his immigration to the United States in 1982. 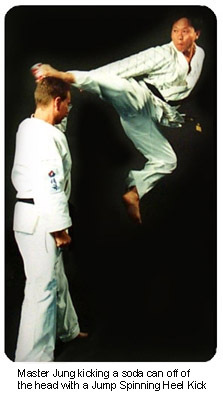 Since arriving in the United States, Master Jung has been promoting Hapkido, training students with a strict philosophy of respect, discipline and self confidence. Hundreds of students spanning the United States from the east coast to the west coast, have achieved Black Belts under his instruction. His dedication has been appreciated and awarded by politicians, professors, and chiefs of military forces and law enforcement. 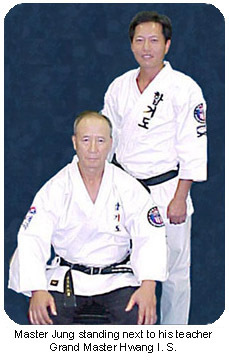 In June of 2001, with greatest honor, Master Jung was appointed as the president of the WORLD HAPKIDO ASSOCIATION. © 2011-2012, World Hapkido Association. All rights reserved.